Take back your back seat with City View™ Space Saving All-in-One car seat! Its narrow design makes space for you and your little one so youre ready for any adventure. 3 ways to ride allow the seat to grow with your child from 5-100 lb. SecureStop™ Anti-Rebound Bar adds an extra layer of protection when rear-facing by reducing the amount of rearward movement of the car seat during a frontal collision by over 45%*. Adjustable harness and headrest easily move together to accommodate your growing child - no rethreading required! Large, color-coded belt paths and one-second, push button LATCH system makes installation easy. Designed for peace of mind, City View™ is side-impact tested and tested to Baby Joggers TRUE Test™ standard. 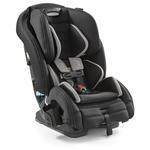 Your back seat just got bigger with the NEW Baby Jogger City View™ Space Saving Car Seat!